These are not all of the lyrics of course -- but the feeling is the same! Tomorrow is the April Technique Junkie stamp release day! Hooray. Even the Design Team has not seen all of the stamps yet (as I write this). So please join us bright and early to see new stamps on Friday morning. Come and see what the blog candy will be for you to enjoy! See which stamp calls to you -- and get your 15% off before April 8. NO April Fool's joke will this be! I really should use some black cardstock on top of cards that have a white base. Otherwise it often makes it difficult to see the edge of the card. Thus is the case with this card. I was stamping with a cousin and she had either seen this card or something on Pinterest or her local SU demo had created a card like this. I used a sheet of background paper that had the little flowers in a shiny resist print. I sponged color all over the piece of background paper I was using., Then i used the same color tones for stamping the Lotus blossom from SU. There are three layering stamps to create this look. I made a birthday card but just about any greeting would work. 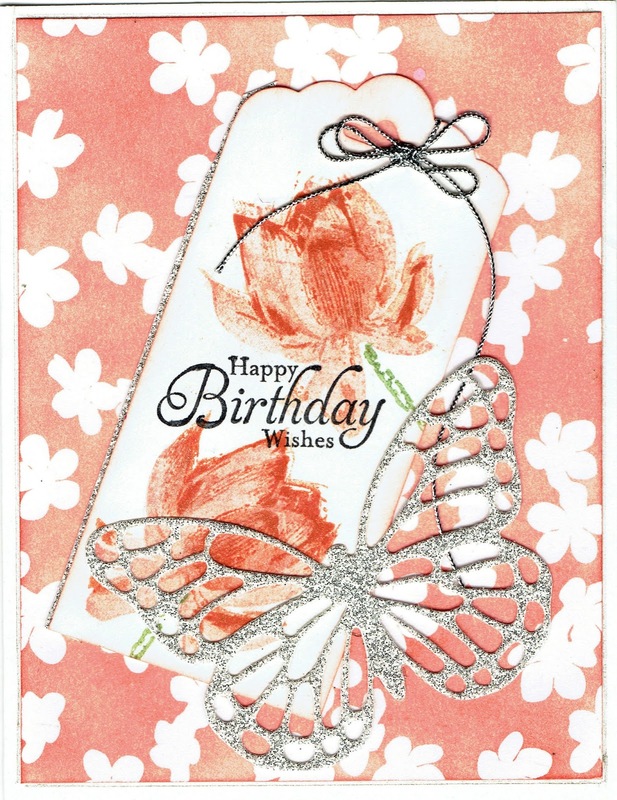 The butterfly is die cut out of silver glimmer paper. I very lightly sponged around the edge of the tag to give it some definition from the sponged background paper below. But even at that -- while the was lovely, it seemed ot last "pizzazz" if you know what I mean. So i took a very narrow strip of the silver glimmer and put it on one edge of the tag. The silver butterfly on the other side was enough glimmer there I thought. I put liquid adhesive on the back of the tag and adhered that to the glimmer paper., My strip of glimmer paper was about 1/3 of an inch wide. A double silver bow at the top finishes my card! But now an advertisement from my "sponser" -- there will be a Blog Hop on Friday April 1 for new April Releases of Technique Junkie Stamps. Please check back with me on Friday. I will have four cards to share on Friday! Have a wonderful day -- and get inky! And see you on Friday! Whenever I scan a card, I never know just exactly how close to "real life" the scan will be. Sometimes it is really close and sometimes not so close. This is one of the latter times. No matter how I tried to "fix" it in Picasa, the colors in the background just do not show up very well. The bicycle and other parts of the background were colored in with my Copic markers. The arched words part of the stamp background are highlighted in a pale yellow, and the small words behind the bicycle are highlighted in a peachy color. 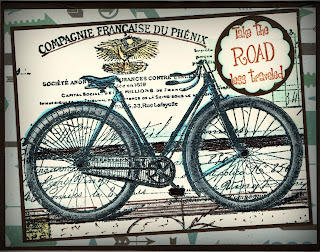 The bicycle stamp is a March release French Bicycle Collage - http://techniquejunkies.com/french-bicycle-collage/. And the saying which was punched out and sponged around the edges is from the very versatile Technique Junkie word set Things I Want to Do - http://techniquejunkies.com/french-bicycle-collage/ . I used a rust colored to stamp it -- because it went with the peachy color you can no longer see. The background paper I chose has just a lot of arrows pointing in different directions. I thought it fit the saying very well. Have a great and inky day! I love Spring. I love summer. I love warm weather! I would love it if the temperature was between 75 and 90 degrees every day of the year! My Spring bulb plants are up -- only a few are blooming -- so far! The crocuses and snow drops have bloomed and are done. But the tulips and daffodils are still coming! And my winter-over pansies are waking up and blooming! Yeah for spring flowers. 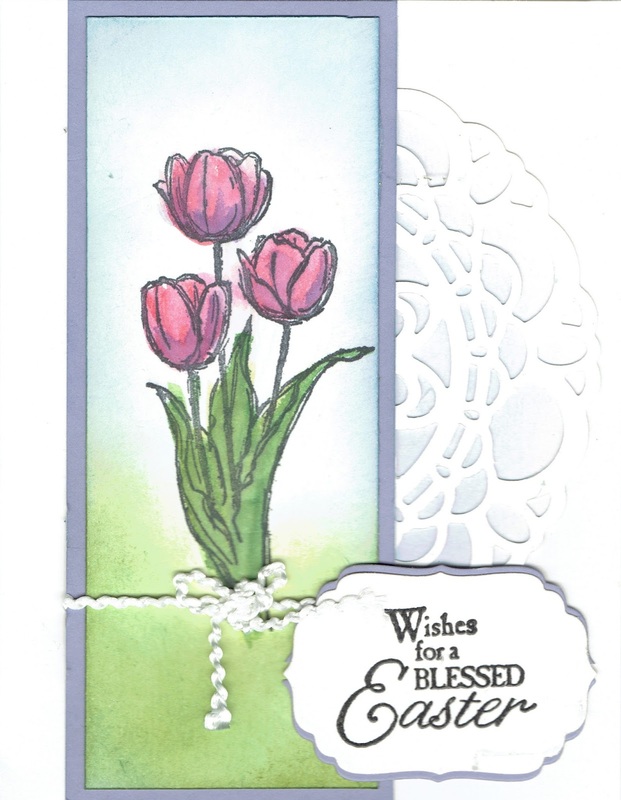 With that in mind, I will share a couple of cards I recently made for Easter that feature Spring bulb flowers. 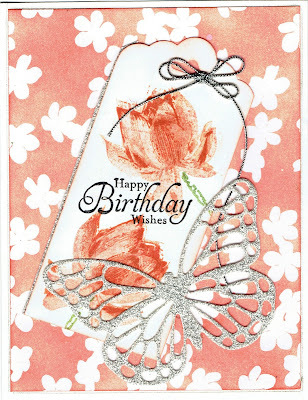 The focal image is from Rubber Necker, and the greeting from Stampin' Up. The daffodil stamp was colored with markers direct to rubber. These next two cards were created with Stampin' Up stamps and the focal images were watercolored. They are on a white card base which isn't showing up clealry. I hope your Easter brings you joy in the glory of the Resurrection! God bless you all. 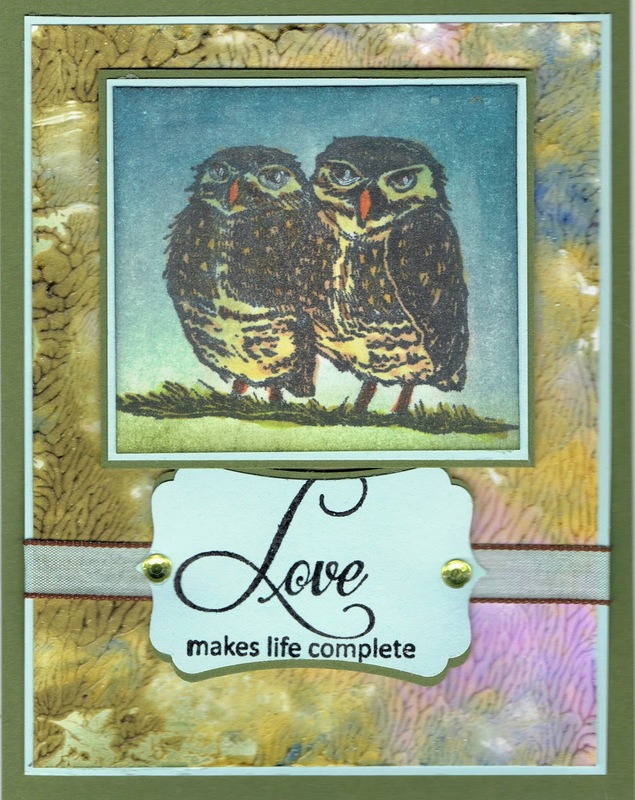 For this card I used another Technique Junkie stamp March release called - Owls - http://techniquejunkies.com/owls/ . 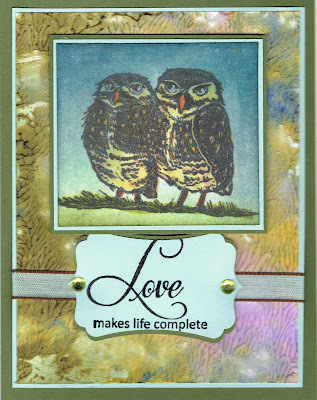 I stamped the focal image in brown Memento ink and colored in the owls with my Copic markers. 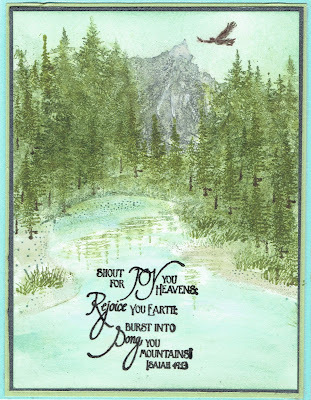 The verse is also from a Technique Junkie stamp set called Wings Quotes - http://techniquejunkies.com/wings-quotes/ . It is a good set to use with birds and butterflies and any thing that flies! I used my Copic markers to color in the Owls and the grass. I used varying shades of blue ink - starting from the top of the card - to bring down the night sky. Then I painted over the ink with my Wink of Stella pen adding some glittering stars in the night sky. I layered this focal image on card stock that I laid on my desk and when I sprayed glimmer spray it accidentally got over this dark blue card stock. Not wanting to waste card stock with glimmer spray, I set it aside for the perfect time. to use on a card. I decided this was it. 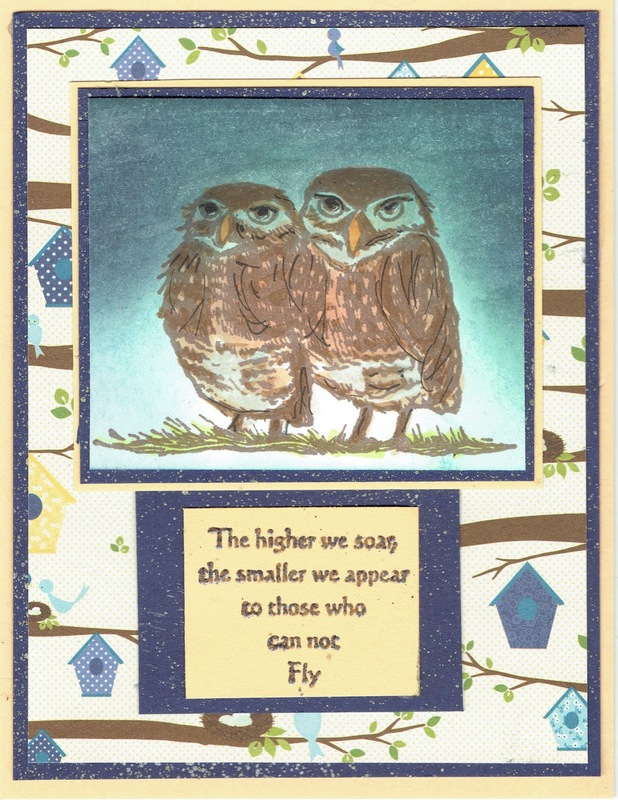 I used a brown and blue mixture of embossing powder in my stash for heat embossing the sentiment from Wings Quotes. Then I layered it on some the glimmer sprayed blue card stock. This focal image was layered on some bird house background paper, which was layered on more of the glimmer sprayed dark blue card stock, and then placed on the base card stock. Have a great week and get inky. The beautiful veiled lady is a newly released March Technique Junkie Stamp. SD658 Veiled Woman http://techniquejunkies.com/veiled-woman/ The first time I saw her she reminded me of Katherine Hepburn. I used Copic markers to color her face and eye shadow. I also used Technique Junkie Stamps SD669 Too Many Options http://techniquejunkies.com/too-many-options/ . That saying stamp was heat embossed with detail black embossing powder. The verse was layered on a piece of torn vellum. I wrapped an organdy ribbon around the the panel before adding the focal image and saying. Then I tied it in a bow and used my heat gun to "crinkle" the ribbon a bit. 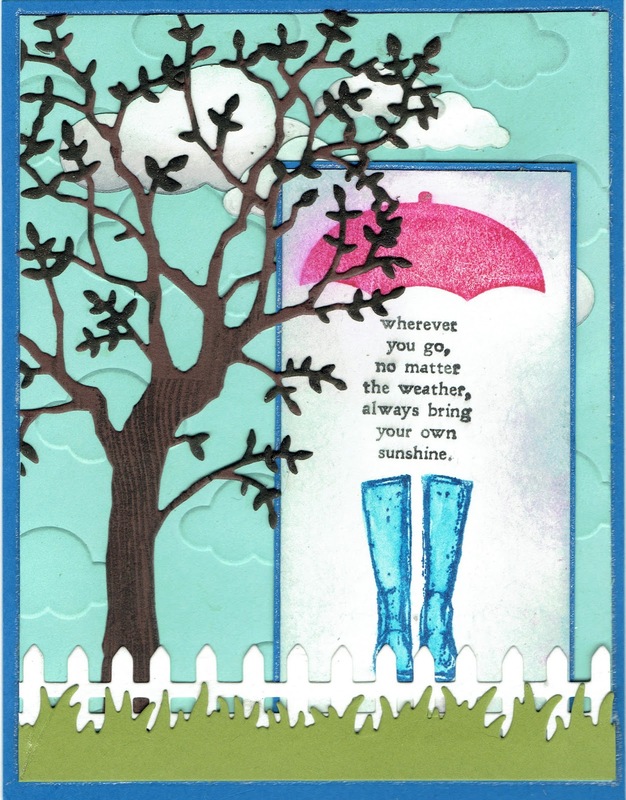 For this card I used a Technique Junkie Stamps March release called Bring Your Own Sunshine - http://techniquejunkies.com/bring-your-own-sunshine/ . I cut some background paper that featured road signs on some pavement on black card stock, I wrapped three lengths of red ribbon around all of this and then layered it on gray card stock. The focal image was mounted on my card and I was done. It is always good to have some quick and easy ideas in mind for when you need a quick card. With Spring rapidly approaching, this card would be appropriate for graduations, new jobs, or even for a friend who is moving to another area. Have a great weekend and get inky! Easter is a season of hope - no matter how you celebrate it. For me personally, Easter has very strong meaning. It is the season in which we celebrate the fulfillment of Christmas and exactly why the Baby Jesus came to earth in the first place. Easter means the Resurrection of Christ. With that in mind, these tulips and the verse blend together beautifully. Easter IS the HOPE in the Resurrection. Because of Easter, there is always hope for the future, always hope in the present, always hope in my own faith in the love of God and His redeeming love at work not only in me personally, but in all of the World. 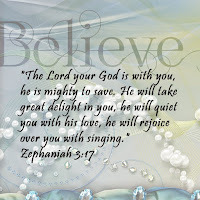 We seldom see exactly how God is working, but we can ALWAYS have the hope that He is! 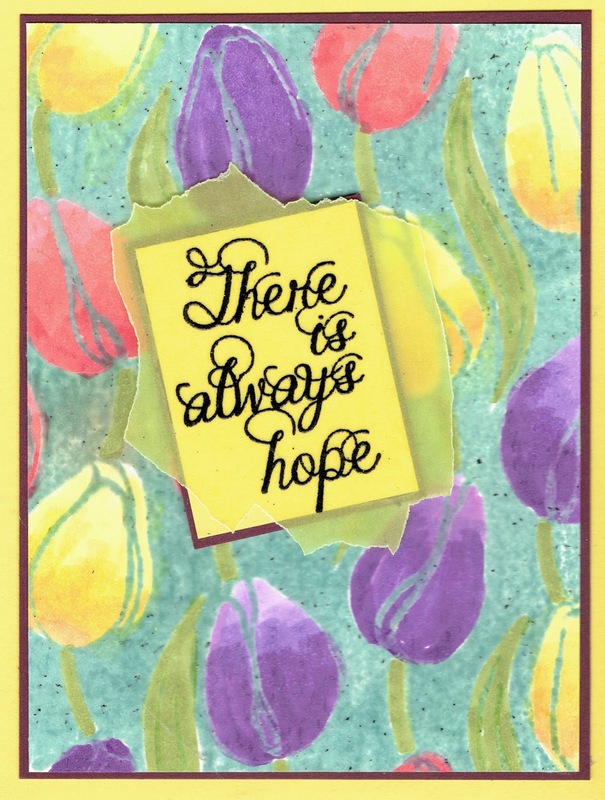 The tulips here are from Technique Junkie Stamps S662 Tulips - http://techniquejunkies.com/tulips/ The verse is SD 651 Always Hope - http://techniquejunkies.com/always-hope/. I measured the verse to have the correct size for the yellow and purple card stock underneath the vellum. I ran the card stock through my Xyron machine in order to stick it to the back side of the vellum. I had to use an adhesive eraser on the bottom left corner of the card stock. I heat embossed the verse on the vellum and then tore it. 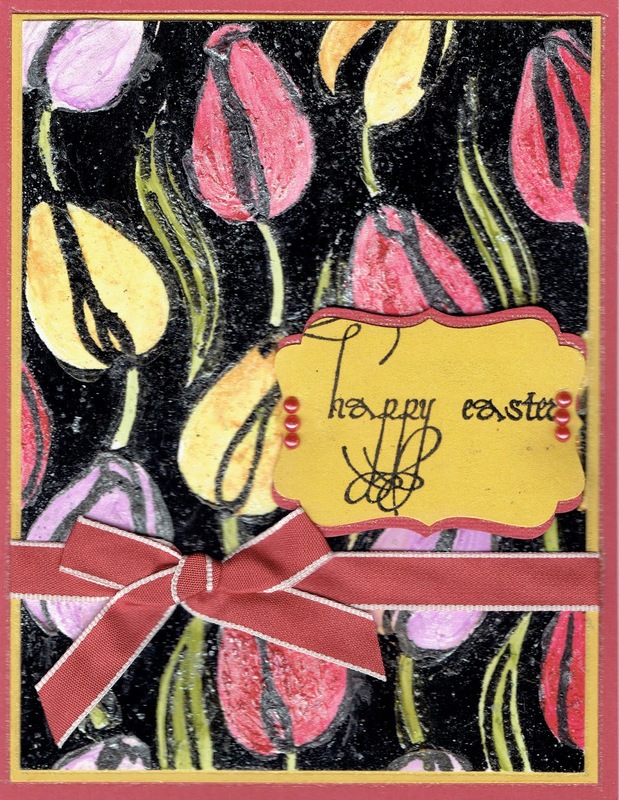 The tulip background was stamped and heat embossed with clear embossing powder. I first first inked up the large background stamp with versamark and then with the light blue dye based ink. Then i was able to cover it with clear embossing powder and heat emboss it. I colored the the tulips with several shades of Copic markers. Sometimes you just need to be able to make very quick card that is still creative. That is what this card is -- very creative but has a certain WOW factor. Both stamps are Technique Junkie stamps: Growing Wild http://techniquejunkies.com/growing-wild/ and a verse from the stamp set Things I Want to Do http://techniquejunkies.com/things-i-want-to-do/ . The back ground is sprayed with a green Art Anthology Colorations spray, next I sprayed some yellow in the corner for the sun, and the sky was sprayed with blue. Then I stamped the flowers with a black pigment ink and heat embossed with a clear embossing powder. The same was done with the verse. Layer both the verse and the the focal panel, Tie a ribbon around the focal panel, and finish the layering on the base card. Most often when I stamp and color in an image, I then after to search for my background for my focal image. That is exactly what I did with this. I colored this image with a group of stamping friends. Then a few days later I put this card together (and several other). I still felt this background paper was too bright or bold, so I decided to layer a piece of patterned vellum over about 2/3 of the paper. That muted the brightness a bit and I liked the results. The left edge, the top and bottom of the vellum are straight and the right is torn. If you look carefully you can see that the blue edge of the flower part on the right is brighter than the blue flower under the vellum (to the left of the face). A tiny black rhinestone was added for her earring. Both stamps are Technique Junkie stamps. The lady is Veiled Woman http://techniquejunkies.com/veiled-woman/ and the saying is Believe in Yourself http://techniquejunkies.com/believe-in-yourself/. Some stamps just seem to call for a few die cuts to go along with them -- at least to me. I thought this one did just that. So this Technique Junkie March release of SD668 Bring Your Own Sunshine http://techniquejunkies.com/bring-your-own-sunshine/ was used with several die cuts. I used a tree, grass, fence panel, and clouds from a variety of companies. I used some gray ink to sponge on the bottom of the clouds because it is about to rain! Spring is coming and the tree is not in full bloom with its leaves. So the thought of being and bringing your own sunshine no matter where you go and wherever you are is a good one. Having an optimistic outlook is so important for our mental health. Have a great and inky day. Today I am showcasing another new Technique Junkie stamp March release - SD664 Owls http://techniquejunkies.com/owls/. They are so cute! I also used Technique Junkie stamps SDX 069 Love Complete - http://techniquejunkies.com/love-complete/. This would make a nice anniversary card -- or if the right colors and background were used it could be a wedding card or a Valentine card. 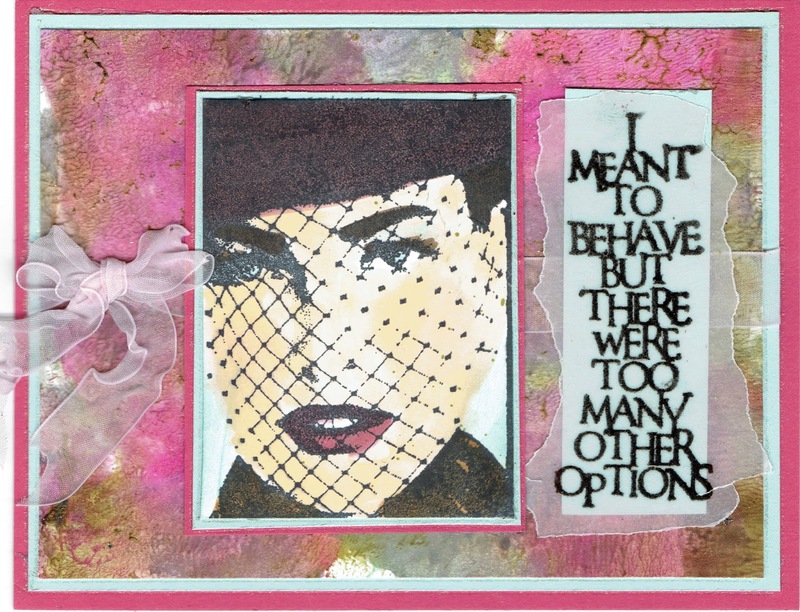 My background is done with various colors on a Gelli art plate. http://techniquejunkies.com/3-x-5-gel-press-monoprinting-gel-plate/ And it comes in more than one size. Add a ribbon and some brads and -- done! One of the things I like to do is learn a technique from one place and try to apply it in another way with different stamps. I tried to do that with some stamps from Stampscape and from Our Daily Bread. 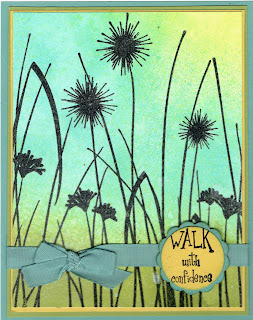 I also used some of the "grass" stamps from Art Impressions. And this is what I came up with. I used a modified version of the watercoloring technique from Art Impressions. 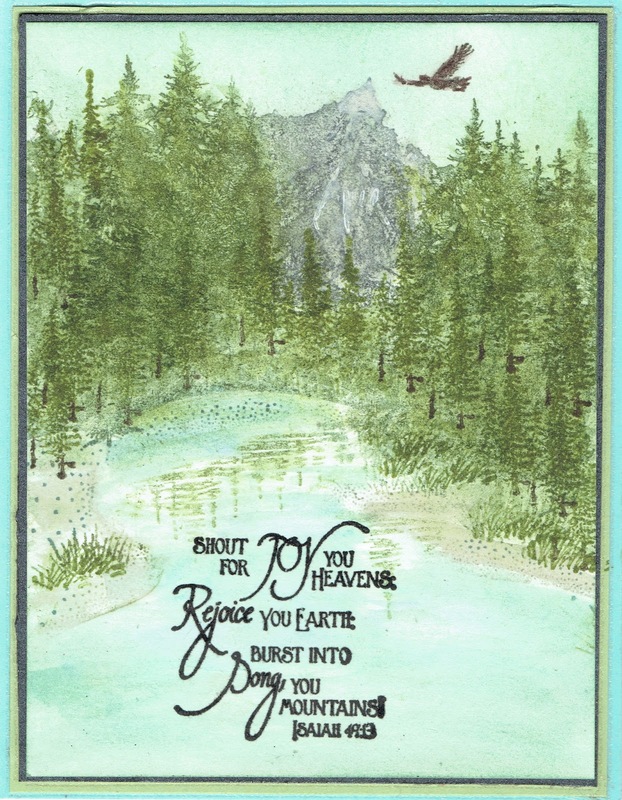 The trees and lake are Stampscape and the mountain, eagle, and verse are from Our Daily Bread. What do you think? Does it look like watercoloring? Are you getting inky today? Happy March! New Stamps, New Cards, Fun March Releases Hop! Happy March 1! I am so very excited for Spring this year, and every month the calendar turns over a page I am sooo looking forward to warm weather! Some of the stamps released this month deal with some warmer weather subjects! 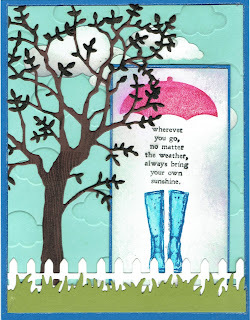 Happy Blog Hop Day for Technique Junkie Stamps - it is a wonderful day!! I always find it so interesting how different we all work and yet how interesting every card or project is! Doesn't the Design Team produce such interesting and delightful work? Don't forget that all of the newly released stamps for March are on sale for 15% off until March 8th. The percentage will come off automatically. If you haven't started at the beginning of the Blog Hop, please start at this blog first: Design Team Blog http://techniquejunkies.blogspot.com/2016/02/its-release-day-welcome-to-hop_29.html . And now with the new stamps! Unless you live in Florida or some other place warm year round, you won't be out riding your bike in January! 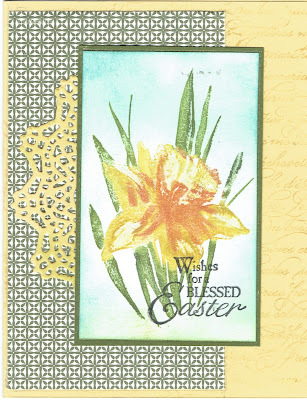 I used a white card stock and sprayed it with spring colors of Art Anthology Colorations sprays. 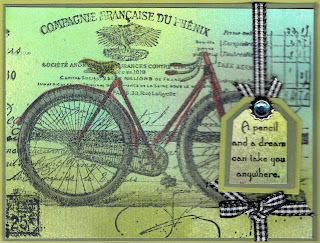 Then I stamped Technique Junkies stamps P037 French Bicycle Collage ( a Palettini Collection stamp) with black Memento ink. The direct link for this stamp is http://techniquejunkies.com/french-bicycle-collage/ .Then I used my Copic markers to color in the features on the bike. I layered it and tied a ribbon around it. 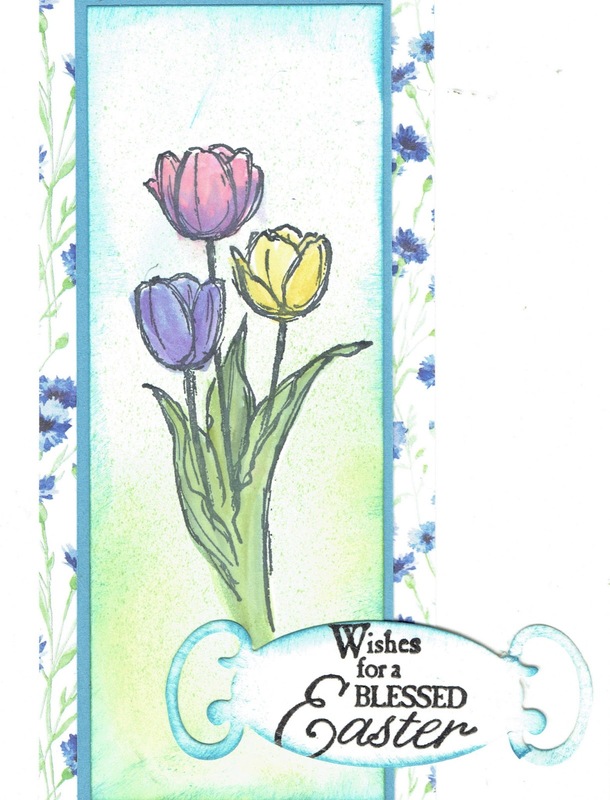 I added a tag with a greeting from Technique Junkies S424 Dream Quotes stamp set http://techniquejunkies.com/dream-quotes/. 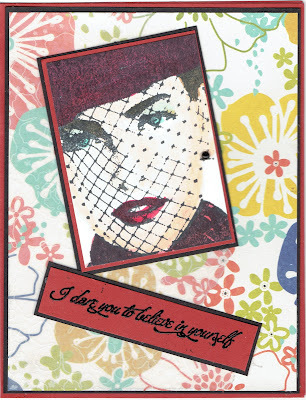 My next card uses Technique Junkie background stamp S561 - Sweet Nature http://techniquejunkies.com/sweet-nature-large/ and the new release of Technique Junkie stamp SD658 Veiled Woman http://techniquejunkies.com/veiled-woman/ . For the background I used a piece of white card stock. 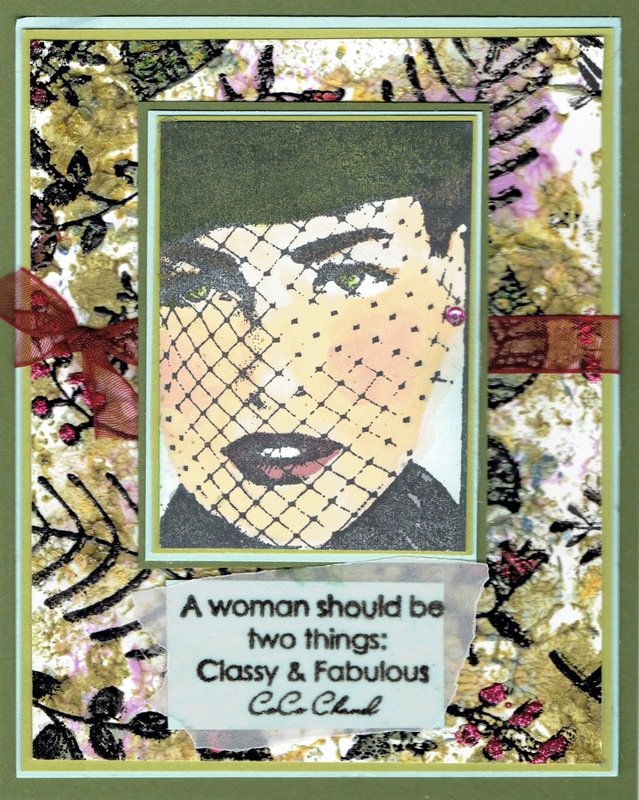 I had been experimenting with an Art Gelli plate (and TJ sells them!) http://techniquejunkies.com/5-x-7-gel-press-monoprinting-gel-plate/ . They are fun -- a little messy - but fun to see what kind of looks you can achieve. Then I first used an embossing buddy over the dried paper. I stamped Sweet Nature with a black pigment ink and used detail fine black embossing powder. 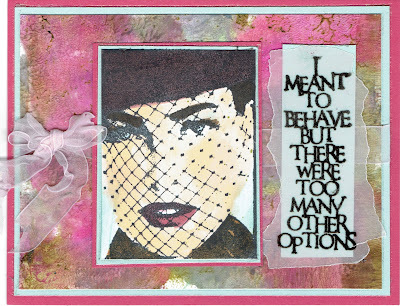 It is important that that card stock from the gelli plate printing is completely dry before you do this. I added some cranberry stickles on parts of the image. I stamped my lady with black Memento ink, and colored in with my Copics. 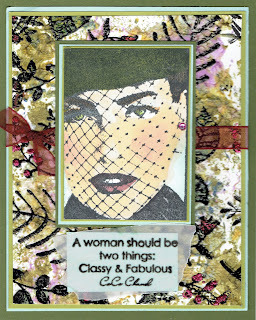 Then I stamped the new Technique Junkie stamp SDX 070 Classy and Fabulous http://techniquejunkies.com/classy-and-fabulous/ on a crap of card stock and layered it on a scrap of vellum before I adhered it under the focal image. MY last card for you today is a clear reminder of spring! Technique Junkies S662 Tulips http://techniquejunkies.com/tulips/. They are closed and ready to burst open in the warm spring sunshine! I can hardly wait! I used Versafine Black ink and stamped on white card stock. I covered it with detail black embossing powder and heat set. To color the tulips I used Art Anthology gel medium paints in a color of colors http://techniquejunkies.com/products-and-accessories/art-anthology-products/. I used a damp paint brush to clean off the gel medium from the lines on the flowers and leaves. I let it dry well and then stamped the greeting stamp from Technique Junkie stamp Holidays 1 Flourish Sentiments set http://techniquejunkies.com/holidays-1-flourish-sentiments-set-of-7/. I used black pigment ink and detail black embossing powder and heat set it. 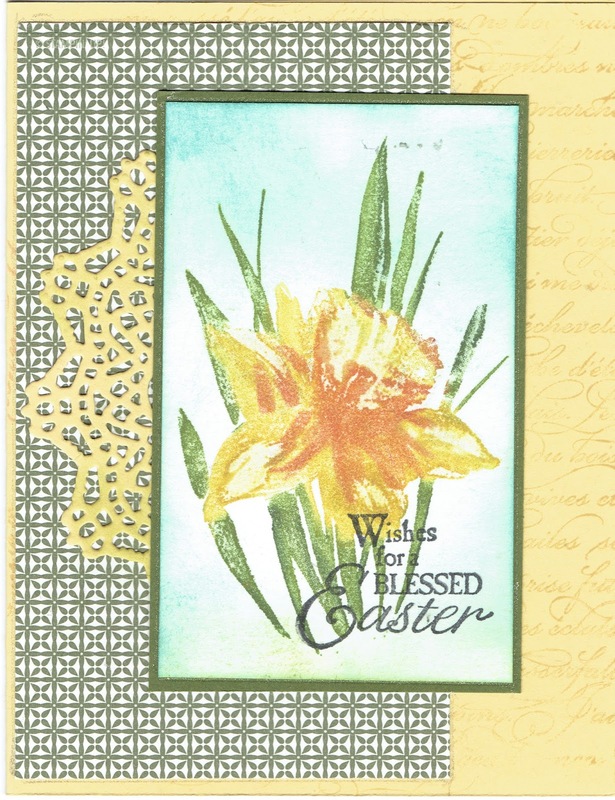 Easter is early this year so get your Easter stamps soon. I hope I have inspired you with these cards today! Other folks on the Technique Junkie Design Team blog hop want to inspire you are well. So here is the entire Blog Hop list. Have a wonderful time and don't forget to leave some comments for the members of the Design Team in the Blog Hop. Doing so encourages us all. 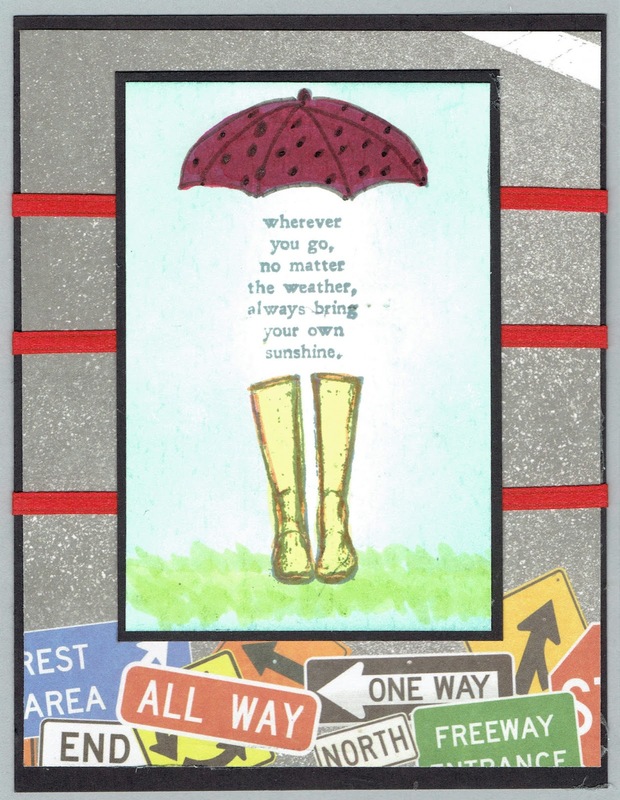 Your next stop on the Blog Hop is with Karen McAlpine -- she will have a fabulous project! Judy Jackson: You are here! Karen McAlpine: Go here next! 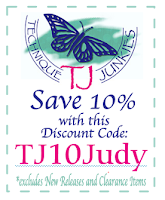 Don't forget, all of the new March Release Technique Junkie stamps are on sale 15% off until March 8. Be sure to shop soon! Are you getting inky during this transition form winter to Spring? I hope so! On you go to the next hop!